credit crunch kitchen: some catching up and a sudden change in diet! some catching up and a sudden change in diet! Also, meals have been simpler, less experimental, and much more based on time available than anything else. I read his book in about 3 days, devouring the details and revelling in the familiar emotions he expresses in his quest, and felt very hungry while doing so! A few days after the show, I attempted to recreate the meal he'd cooked during his show, especially his mum's amazing mint & apple chutney. If you want to know how to make it, pester him on Twitter til he tells you, tho I will see if he doesn't mind if I write the "recipe" up at some point... He's the friendliest and sweetest of blokes, and I feel he would be quite happy to share, and to be honest, it's a simple accompaniment that deserves to be shared round! It was a complete hit with all the family, especially the hint to use star anise with the mince. Another meal that was a huge hit was my mini toads in the hole. 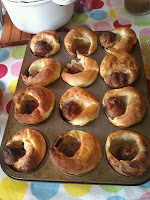 My adapted yorkshire pudn batter poured around little balls of good quality sausagemeat browned first in dripping in the holes of a muffin pan. Another day I did a very successful meatloaf, Littl'Un had thirds... I served with with some potato wedges, brocolli, and a creamy Ikea style gravy. The best part was using a silicon loaf pan to cook the meatloaf in. SO easy to clean! Then suddenly, about a month ago, everything changed. I was diagnosed with gestational diabetes, and had to take the decision to utterly overhaul my diet. My parents and brother are all diabetic (type 2) so I wasn't entirely surprised to be diagnosed, though I was annoyed that it was about 10 days after the test that a midwife casually mentioned the diagnosis to me. At least I have plenty of experience of the ideal diabetic diet, and my interest in nutrition was a great support, but it was yet another week before I was able to see a diabetic specialist midwife, and obtain a glucometer, and then ANOTHER 10 days before my diet and sugar levels were assessed and I was then put on Metformin. The basic diabetic diet is not really at all hard, but there are slightly more restrictions in pregnancy as any and every sugar surge can affect the baby. I basically avoid all added sugar completely, and eat limited amounts of fresh fruit spread evenly through the day. I avoid refined carbohydrates as they also break down into very simple sugars, and the carbs I do have are around a third of the meal. I'm careful to aim for low GI foods, and to have regular healthy snacks between meals. I have lean proteins, lots of veg and salad, pasta, wholemeal breads, basmati or brown rice, nuts and lentils. I don't have to be as restrictive about fats as a non-pregnant type 2 diabetic, as the baby is laying down fat in these last few weeks. The problem is that the kids adore their fruit, especially in the summer, and also a high fibre, low fat diet is utterly unsuitable for small kids, as the fibre will fill them up too much and could cause bowel issues. Kids need plenty of energy to grow and develop, and enough protein and carbs to get that energy. Then again refined white shop bought bread isn't really a "good" food for anyone! In most cases I've been able to find meals that suit everyone, possibly my best recent meal was a home made pizza, where I made the dough for the base by hand, with half wholemeal and half white bread flours. Littl'Un just loved the texture and nutty flavour both on the first day and cold the next day, and I suppose it helped that I chopped up the toppings and let the kids each make their own pizza. Papa has also been trying his hand in the kitchen, and I've loved the Gill Holcombe books for those meals, as well as copies of easy cook magazine, for some simple, imaginative, cheap and confidence-boosting recipes for the novice cook. My spaghetti "lentilese" was resurrected and went down well, and was very quick and easy, and of course cheap! And the supermarkets have been selling special offers for Ramadan, so red lentils and other Indian basics have been cheap and I've stocked up where I can! I also bought a copy of Hungry, after browsing through a copy for far too long in Sainsbury's. I have used it a bit, but it's quite fruit heavy, so I shall hold off for a little longer. It's a fab read, and great fun though and I do recommend it very highly to anyone with kids, or without! Some really super ideas and recipes and 85% of the recipes incorporate a couple of your 5 a day fruit/veg. The recipe for the falafel was from a children's cook book which I've used for years, and would recommend wholeheartedly. I must add, since cutting sugar out of my diet, I do feel FAR more healthy and energetic. I feel less bloated and less sluggish, and my skin has cleared up, and I find sweet things taste too sweet, and I don't really mind not having sweet food. I have a little sugar free drink from Sainsbury's most days, because they use sucralose, which is the only artificial sweetener I feel safe using, and even those, I'm not that bothered with. I do have a little fruit, and my previous late evening puddn hit is easily sated with a glass of milk and a few almonds. I made a couple of 2 person rice puddns, which uses 2 tbs sugar in the whole dish, which is pretty low, and using a little cinnamon meant I didn't feel any need to add jam, but Papa was able to if he wanted to. I found sucralose jelly and sucralose instant custard, but they both taste WAY sweet to be honest. I'm pretty sure I'll stick mostly to this new improved diet, even after baby is born, because it's so much better anyway, and because I'm a bit of a ticking time bomb in any case! And it's not hard, and I have quite honestly experienced so many health benefits anyway. I will be more than happy to give up "punctuating" my fingers to test my sugar levels 4 times a day though!